Well if you want to know the truth...the Garfield family lived in the musty basement of the Canal Bar along with the fischer-price toys. When my grandmother died, I cleaned out her house and couldn't bring myself to part with my childhood collections. I put them in the basement of the 3rd Avenue apartment (I lived there for 3 years) and left them there when I moved to Crown Heights (which was a stupid idea). Well anyway, I didn't last in the Heights for more than 9 months, lucky I even made it out of there alive... But having been vacated from 3rd Avenue apartment for 9 months, the owner of the bar said I just had to get my stuff out of the basement. I went. The answer was to purge. What was I ever going to do with a tote box full of garfields? They certainly wouldn't fit the decorating scheme of my new residence...a victorian country house on eastern Long Island. Not wanting to throw away my childhood, and being too lazy to schlep them to the Salvation Army, and knowing that no self-respecting Park Slope parent would fish them out of a box for their brood if I were to leave them on 5th Avenue...I did the only thing I could do. Together with my friends (former neighbors; current residents of the aparment above the canal bar, we disposed of the garfields down by the Gowanus. In a late night covert operation, we climbed the truss of the bridge to create an impromptu garfield totem pole. Was she/he sober when they did this? When you can, come live in my neighborhood, Windsor Terrace. 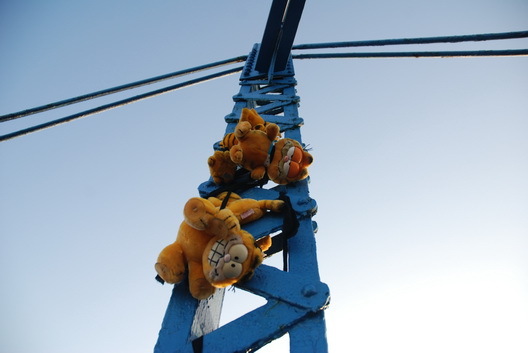 We could use more guerilla garfield (or whatnot) installations around here. I liked it a lot. What a story! There is so much contained in this one 419-word email -- childhood memories, the metamorphosis of Brooklyn, a strange, surreal act of kindness -- that it reads like a mini-memoir. I hope the folks who get the Garfields take pictures of them in their new homes and email them to Gowanus Lounge.